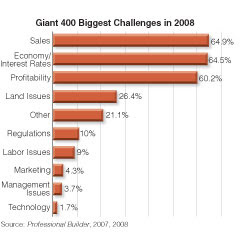 Housing's giants list sales as their biggest challenge (64.9 percent of respondents), narrowly edging out fears related to the economy and interest rates (64.5 percent). Land issues are a distant fourth (26.4 percent), but land is actually the key component of this downturn — the Old Maid card no production builder wants to hold when people stop buying houses. The high and mighty titans of the housing industry — publicly held builders like No. 1 ranked D.R. Horton and No. 2 Lennar — are h umbled by holding too much land bought at the peak of the market, at prices now out of whack with falling home prices. New York-based housing market analyst Ivy Zelman says this slump is far from over, predicting that by the end of 2008 the largest builder may have 20 percent fewer closings and revenue than in 2007. "It's ugly out there," Zelman says. "The public builders are challenged as never before, and most of the private builders are dependent on the banks for financing, and those banks are behaving irrationally right now." When the market does recover, it will be interesting to see if the largest builders can recover their momentum and resume growing. The public builders have laid off hundreds of good managers, who just might start their own companies when they have the chance.